You don't need more time or money to eat healthier. Here are four adjustments you can make to the way you shop for food that will allow you to get a better bang for your buck or, rather, more nutrients for your nickle. Almost every imaginable Bob's Red Mill product for $2.69 to $11.99 at Ocean State Job Lot in Pawtucket! 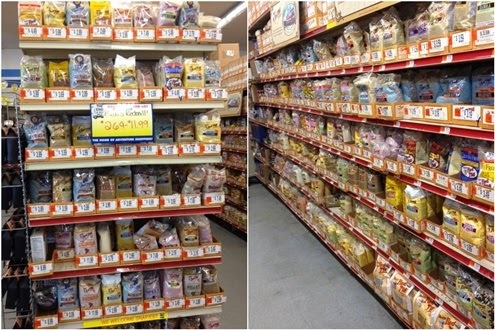 I went to Ocean State Job Lot in Pawtucket and discovered an entire aisle filled with Bob's Red Mill natural food products, competitively priced, undamaged, and not at all near expiration date! Your local discount store might also have organic food. It is certainly worth looking in the food section next time you're there. If you find a good deal, stock up so you can postpone future trips and thereby save time and gas. Buy organic when it counts most. Check out EWGs 2014 Shoppers Guide to Pesticides in Produce. Buy conventionally grown low pesticide fruits & veggies ("Clean 15") like avocados. Use the money you save to spring for organically grown apples and other variety of produce on the "Dirty Dozen plus". Pay for your CSA (community supported agriculture) membership once and you'll get a box teeming with local, seasonal produce every week. It's way less expensive than shopping at the supermarket or even the farmer's market. Plus, there are no impulse items like chocolate bars or chips being waved in your face at the pickup spot, throwing you off your budget or your healthy diet. You'll save time too- no checkout lines, no decision making. Find a CSA near you here. They're usually filled with expensive empty calories. Start your grocery shopping trips in the periphery of the store- produce aisle, bulk section- and fill your cart there. If you choose to eat animal products, do so in moderation and invest the money you save avoiding processed foods to consume animals raised outside a factory farm. (Here's some info on meat labels.) If you don't eat animal products, just laugh all the way to the bank. These are just four ways to shop smarter and empower yourself to eat healthier now without investing additional time and money. Got any tricks you'd like to share? Leave a comment.